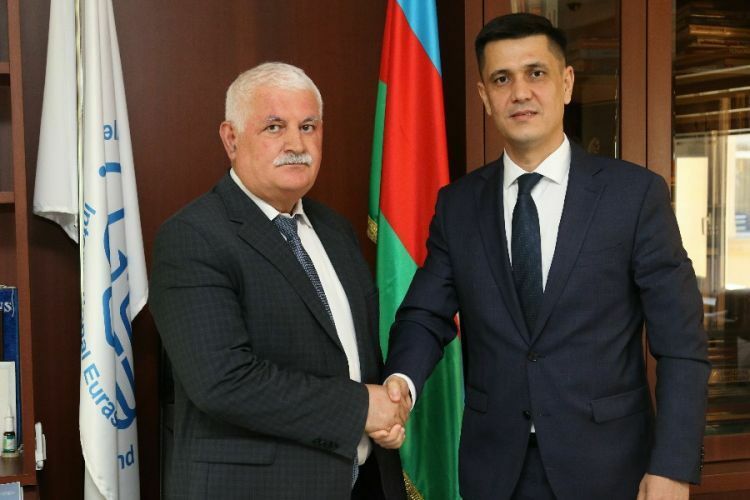 Extraordinary and Plenipotentiary Ambassador of Turkmenistan to Azerbaijan Mekan Ishanguliyev visited the International Eurasia Press Fund (IEPF) and got acquainted with the activities of the Fund and its projects. President of IEPF — Umud Mirzaev informed the Ambassador of Turkmenistan about the activities of the Fund. He noted that since its establishment in 1992, IEPF has expanded its activities and currently has a large network of partners in many countries around the world. The President of the Fund 25 years talked about the projects implemented by the IEPF in the field of civil society, socio-economic development, work with refugees and IDPs. Umud Mirzaev noted that the dissemination of objective information is also part of the Fund's activities. The Fund implements various humanitarian projects in cooperation with international organizations, UN agencies, foreign diplomatic missions in Azerbaijan. The President of IEPF also emphasized the importance of ensuring peace in the region. He noted that most people who suffer from conflicts are civilians. The President of IEPF expressed a willingness to cooperate in different directions with the Embassy of Turkmenistan in Azerbaijan. In turn, the Ambassador of Turkmenistan to Azerbaijan Mekan Ishanguliyev said that he is well informed about the activities of the International Eurasia Press Fund in various fields. According to the Ambassador, the cultural and historical roots of Azerbaijan and Turkmenistan are closely linked. Mekan Ishanguliyev said that the main task of the Embassy is to expand and strengthen ties between the peoples of Azerbaijan and Turkmenistan. The ambassador stressed the high level of relations between Turkmenistan and Azerbaijan. Relations between the two countries are developing in a rising direction. A good stimulus for this growth was the official visit of President of Turkmenistan Gurbanguly Berdimuhamedov to Azerbaijan. Then the president of the IEPF Umud Mirzayev thanked the ambassador for his visit. At the end of the meeting, Mekan Ishanguliyev thanked Umud Mirzaev for the invitation and presented him the book "The Living Legend".